How to archive a post you’ve already shared on Instagram? Instagram rolled out the feature to archive the posts first in last month. Now, it is available for all iOS and Android users. It means that you will be able to hide your photos temporarily without actually having to delete them from the profile. 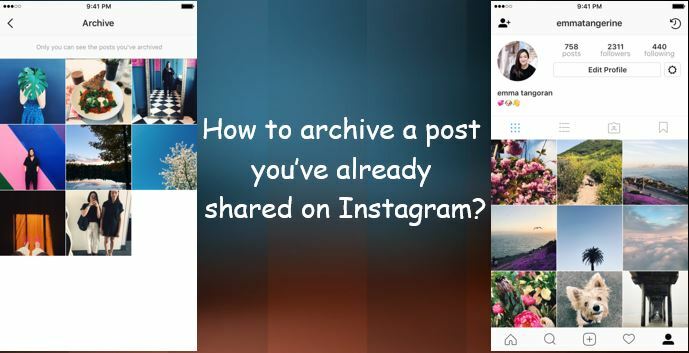 In this post, we are going to guide you on how to archive a post you’ve already shared on Instagram. Open Instagram app in your smartphone and tap “… or | ” near the top of the post and select “Archive”. You must still be able to view the post when you choose the Archive icon in the top right corner of your profile. After archiving the post, you can decide to show it once again on your profile and the post will go to back to the way it was. To do so, you will have to tap on “Show on Profile” at any time and it will appear in the real spot. Note: This feature is available only for the Android and iOS users who are running Instagram v10.21 and above. For more tutorials, visit our TUTEZONE section that contains exclusive articles on how to make your life better using technology.